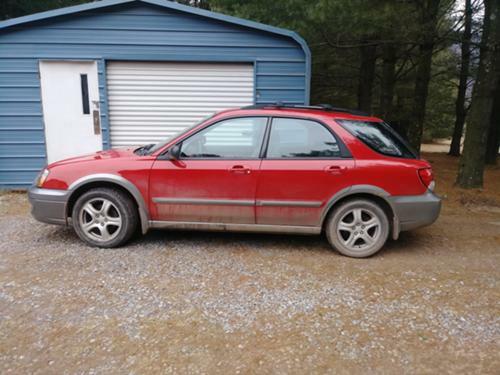 For Sale: 2004 impreza outback sport all wheel drive 189,700 miles automatic transmission. At 177,307 had the heads resurfaced, headgasket, timing belt, new water pump, spark plugs, thermostat, pcv valve, cam gear, a/c belt and alternator belt. All preventive maintenance. Newer brakes, rear struts and just changed the oil. Has a dent in the rear hatch (from previous owner) hatch still works good. I bought it in November, but don't like foreign cars. Runs great. One rust spot on drivers side quarter panel.